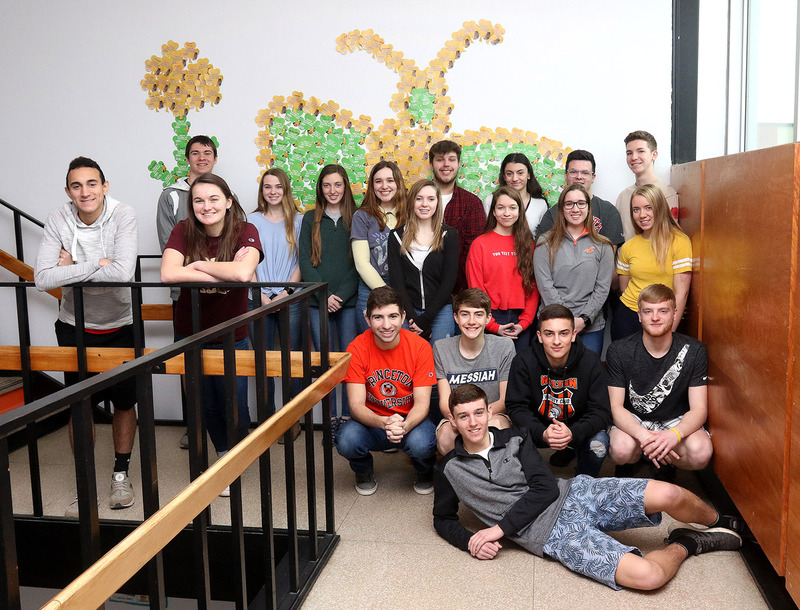 The Walton chapter of the National Honor Society raised $710 during the annual Muscular Dystrophy Association (MDA) shamrock fundraiser. In six years, the WCS NHS has raised $3,678 for the MDA through shamrock sales. The sale raises money to send children with MD to summer camp. The sold shamrocks were hung in the stairway in the high school. Pictured are: Front: Tom Maguire. Second row (kneeling, from left): Vinny Escobar, Isaac Vesterfelt, Max Jacobs, and Kyle Wright. Third row (from left): Jose Mirabal, Olivia Harby, Chelsea Finch. Michelle Ritter, Brooke Gerace, and Madison Graupman. Back (from left): Brett Charles, Sophie Wagner, Miranda Klinger, Mara Little, Christian Vitek, Sophia Elston, Owen Pieper, and River Reed. Missing: Samantha Layton, Madison LeBarge, Hunter McGonigle, Alaina Tweedie, and McKenzie Clough.